Something I had little to no idea about was that nursing was not seen as an acceptable job for respectable women. Either recovering soldiers or drunk women (essentially) were given the task, and it was only with English nurse Florence Nightingale's work in the Crimea and her subsequent Notes on Nursing (1860) that it began to gain any kind of traction as a serious role for women. 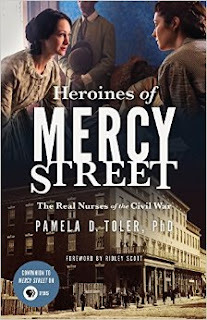 The women who volunteered or were paid to be nurses in the Civil War moved that profession forward leaps and bounds, as even when they appeared at hospitals, having been hired, surgeons and stewards tried to push them out, thinking they would hinder things far more than they could help. By the end of the war, many of the doctors who had previously held female nurses in the highest contempt and referred to them as "worse than useless" would sing their praises. By 1880, there were a total of 15 nursing schools in the United States. By 1900, there were 432. Nursing had become recognized as a skilled profession. The book starts by talking about Dorothea Dix, who essentially tried to single-handedly hire every nurse in the Union. Her management skills are not lauded, but her zeal to get women accepted at hospitals is. She essentially shoved her way into getting her hires placed, and I totally approve. There are so many things in this book that opened up the Civil War and made it more three-dimensional. The existence of transport ships, to ferry wounded soldiers out of swampy battlefields and get them to hospitals. That 64% of Union deaths were from disease. The slow realization by women that they could do something worthwhile that was outside of the home. "I am hearing too many blessings now-a-days from sick and dying men to be in doubt any longer whether or not I am doing good." I became so emotionally invested in one of the nurses the book follows that I cried out when she died, like she was a character in Harry Potter or something. I HAD ALREADY CAST JESSICA LANGE AS HER IN MY MENTAL MOVIE. Agghhhhhhhhhh. WHILE lauding these women and their intense work and sacrifice, Toler still takes time to comment on unfortunate truisms like "racism and abolitionism were not mutually exclusive positions at the time" and even takes on Louisa May Alcott's unfortunate comments on race, which I personally would be too afraid of at the risk of getting pelted with copies of Jo's Boys by rabid Alcottists. Oh, did I forget! Louisa May Alcott was a Union nurse and worked at Mansion House Hospital. And chronicled her time there (essentially) in Hospital Sketches. I've skimmed Hospital Sketches and it is both lively and excellent. She didn't work there long, but she has her place in Heroines of Mercy Street. I LOVE this book and the expanded perspective it brings to something so in our collective memory as the Civil War. I'm going to read more about Clara Barton and all of Hospital Sketches and Hannah Ropes and Dorothea Dix. And the next time I hear about any of those famous battles, I'm going to think about the women who helped save the lives of those who fought in them.